"I wanted to go do it the best I could, considering all the physical limitations. 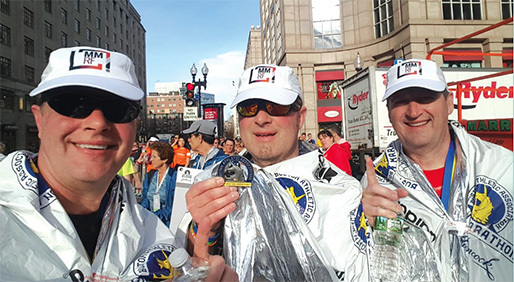 I just wanted to start, and I wanted to finish the Boston Marathon. The notion of time was not in the equation." An athlete and avid runner, it was hard to ever find Jeffrey Goad, a resident of Chicago, sitting still — even after he was diagnosed with multiple myeloma in the spring of 2010, just one week before his 50th birthday. After his first stem cell transplant, Goad was trying to get up and move as soon and as much as possible. “I remember taking my IV pole and taking laps around the hospital floor. I’d try to do at least 10 laps a day,” he said in an interview with Heal®. Those laps turned into fighting insurmountable fatigue to climb the stairs to his second-floor condo, to take a walk around the block, to get through a one-mile walk, until Goad was finally able to build back up to doing what he loves — running marathons. Goad had two stem cell transplants and was deemed to be in remission in March 2011. That fall, he ran the Chicago Marathon with his brothers Brad and David. Back in his competitive racing days, Goad constantly pushed his limits in events like these, trying to beat his previous times and qualify for bigger and better races. He remembers a time when he was just seconds away from qualifying for the Boston Marathon. Now, he was able to focus on putting one foot in front of the other and finish the Chicago Marathon — which he did. In 2012, he ran the marathon again, following that up with the New York Marathon in 2013 and the Monterey Half Marathon a year later. In January 2016, he took a break from running to climb Mount Kilimanjaro with the Moving Mountains for Multiple Myeloma team benefitting the Multiple Myeloma Research Foundation (MMRF). While he may be atypical compared with other patients living with multiple myeloma, Goad was still able to connect with them and their families, especially those newly diagnosed. He would offer words of wisdom to the survivors, while his wife, Ramona, often spoke to the spouses and loved ones to offer guidance on the journey they had ahead of them. Last October, Goad was notified that his application to run on a charity team — the MMRF — was accepted. After decades of dreaming about it, he was finally going to run the Boston Marathon in April 2017. In November, however, he found out that his multiple myeloma had relapsed and he would need more treatment. That did not stop him from running. Throughout last winter, he would receive chemotherapy injections on Monday. By Wednesday, he would be doing speed work with the local Chicago Adidas running club. Saturday meetings were for long-distance runs. Goad wasn’t the oldest person in the group, but he undoubtedly was the slowest. And he was OK with that — for both training and the race. On race day, Goad admits he was nervous about finishing, especially since his longest run during training had only been about 15 miles. But he was even more focused on enjoying the day with his MMRF team, including his brothers. “I turned it into enjoying the experience, the community, the sights, the smell and the sounds that are associated with these races. Not just the end. I didn’t want to be so overly focused that I missed all those things around me,” he said, noting that running as a part of the MMRF team, raising money and awareness for multiple myeloma, added extra meaning to the day. In the past seven years, Goad’s team — himself, his wife and his brothers — has raised nearly $120,000 for the MMRF. And he won’t stop there. In 2018, he is planning to climb Mount Everest with the Moving Mountains for Multiple Myeloma team as he continues to think of more ways to be active and raise money and awareness.